Check out our pre-made Statistics worksheets! You can create printable tests and worksheets from these Grade 6 Box Plots questions! Select one or more questions using the checkboxes above each question. Then click the add selected questions to a test button before moving to another page. A math teacher records student test scores. 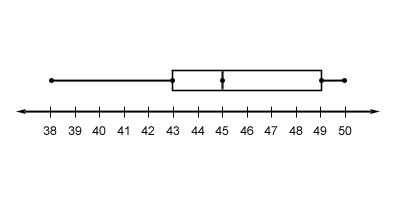 The box plot shows the results. What is the lower quartile value? The students in a sixth-grade class recorded the number of minutes they each spent on homework one night. 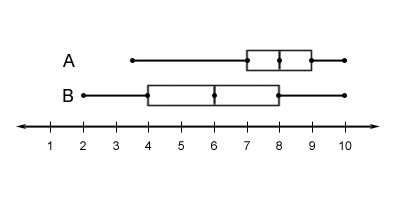 The box plot shows the class results. What percentage of the students spent 43 minutes or more on homework? What is the interquartile range (IQR)? What is the maximum value? What percent of the students scored 95 points or higher? What is the value of the upper quartile? The box plots compare employee salaries, in thousands of dollars, at two companies. What is the minimum value for Company A? What is the range for company A? What is the maximum value for Company A? What is the minimum value for Company B? Which statement correctly compares the median salaries for the companies? Company A has a greater median salary than Company B. Company B has a greater median salary than Company A. The median salaries are the same for both companies. What percent of employees at company B earn $24,000 or less? 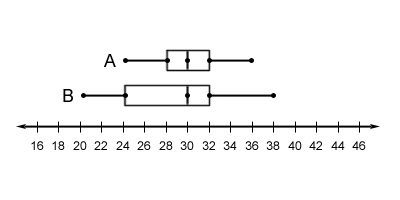 The box plots compare the ages of children who attend story time at two different libraries, Library A and Library B. What is the upper quartile value for Library A? 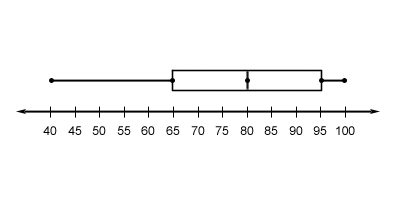 A(n) box plot is a graph that shows the median, quartiles, least value, and the greatest value of a data set. Which company has a higher minimum value? What is the interquartile range (IQR) for company B?